OK, some spoilers. Transmitting data or other signals over IR is essentially like transmitting it over radio — it’s just that the frequency of the electromagnetic waves are a lot higher. Dominic and Mike thought it would be fun to turn the tools that they’re using for SDR and apply it to IR. Along the way, the found some IR audio distribution systems that are essentially FM radio transmitted using light as the medium as opposed to radio. Flamethrower doesn’t work, but looks cool. A sparkler is the ticket. A few months back, there was a viral video that claimed that you could wave a piece of paper in front of a lighter and turn on or off a TV. At Hackaday Global HQ, we all played around with this technique and basically decided that it was bunk. Basically, you need a source of 38 kHz(ish) modulation in the light source. At the same time, on the other side of the globe, Mike and Dominic were doing the same. 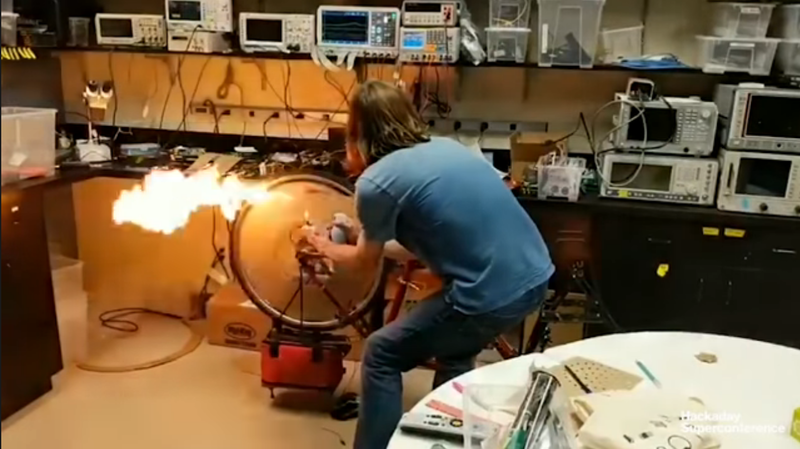 Rather than stop at debunking, they tied a cardboard cutout to a bicycle wheel, experimented with torches and sparklers, burnt their fingers, and got a pretty convincing signal out. We still think the video is a fake, but Mike and Dominic showed that it could work with a modulated light source. And finally, the big hack that Mike and Dominic presented was modulating a bike light that triggers a traffic-light pre-emption system. Remember that urban legend about taxi drivers blinking their lights just right and always get a green? Well, it’s possible, at least with older generations of the system. Mike and Dominic bought a modern receiver and tested this all in their own lab, and lit up a big traffic light for us on stage at the Superconference. What’s next? The two are probably going to head back to radio work for a while, but they encourage us all to have a look at IR. Unlike radio, broadcasting light doesn’t require any licenses, can work at lower and more manageable carrier frequencies and is a cheap and easy point of entry into just the same tools and ideas that you’ll need for SDR hacking. More blinking LEDs! ← Ask Hackaday: How On Earth Can A 2004 MP3 Player Read An SDXC Card? I haven’t seen the talk, but it is a big hand wave to say IR communications is just like RF communications except at a higher frequency. One can do some form of OOK (on-off keying) with IR, which is the RF equivalent of morse code. AM would be possible, but I don’t think anyone bothers. All the sophisticated RF techniques, FM at the low end and high point constellation QAM at the other just aren’t practical. Big hand wave: maybe. But that’s why I use such a low hand-wave length. But watch their full presentation, especially the part about the FM audio. The gimmick is that the information isn’t carried by modulating the (terahertz?) light directly, but instead they’re laying down another carrier in the light at 2-3 MHz, and modulating that. And from there, everything’s exactly like what you’re used to. QAM? Why not. I.e. they’re not doing FM by changing the color of the light. They’re doing it by adding a variable-frequency (few MHz) signal on top of the light. It’s actually tremendously hacker-friendly, and doable at “lower” frequencies with off-the-shelf LEDs. The streetlight switcher is called opticom and it has been around since at least the early 90s. Opticom has been around since the late 70’s. I worked for Taffic Engineering Department 1980 – 1985. in Louisville Ky. We were removing them from service back then.